Who%26rsquo;s smarter: The brainiac who knows everything, or the second guy - who knows how to take all of Mr. Einstein%26rsquo;s money? 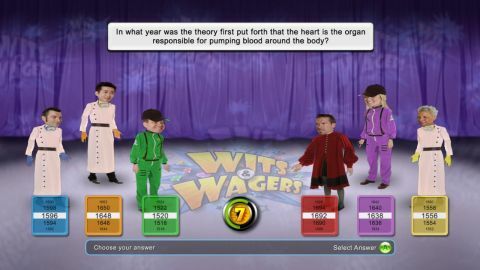 That%26rsquo;s the basic gist of this quiz game, which starts with trivia and adds in a healthy dose of Vegas-style gambling. Oh, and dancing marionettes with cartoon heads. You need those too. Here%26rsquo;s how it works: after everyone selects their avatar%26rsquo;s head %26ndash; ranging from normal to scary robo-chick to what appears to be a crocodile %26ndash; the game starts. Players are all asked the same question, the answer for which tends to be a year or a number; for instance, %26ldquo;What year was Robert Kennedy shot?%26rdquo; Everyone selects their answer from a HUGE range of choices, and the game throws everyone%26rsquo;s guess onscreen for all to see. Then comes the twist: The players then have several seconds to place bets on which guesses come the closest to the actual answer without going over. You can bet as much or as little of your cash as you like %26ndash; there are odds next to each answer %26ndash; and you can put money on two answers for each question. When the timer runs out, the correct answer is revealed and those who choose it are rewarded with the spoils. Therefore, Wits %26amp; Wagers becomes a quiz game in which getting the correct answer isn%26rsquo;t remotely as important as managing your money and properly guessing which of your friends might have the correct answer. Which we have to admit is new to us. There are 700 questions %26ndash; not a lot for a trivia game. But it lasts longer than you%26rsquo;d imagine because each game burns only seven questions, which proves to be more than enough for some players to go broke and others to rake it in. We do wish the timers could be cut off early %26ndash; even if everyone has their answers chosen or their bets placed ten seconds after the clock begins, it still insists upon making you wait while it counts all the way down. But you can use the right stick to make your onscreen character dance like a spastic marionette to pass the time, and at least there%26rsquo;s no tragically unfunny host yammering away like in the BUZZ! games. Put this one squarely in the party game camp, but it%26rsquo;s a welcome spin on the quiz genre. Description You don't necessarily need the right answer to win at this trivia game - it's about knowing how to place bets and how to take money from smart people.